"Evan" is an all leather hunting sporran that utilizes 5 hollow petals to allow more colour to show through. The body of the sporran is made of burgundy calf skin for a very rich look. 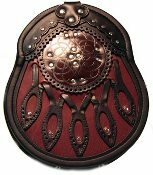 The burgundy targe features a Celtic eternity knot with integrated studwork. This sporran's unique colour will definitely make it a stand out. This is an elegant and powerful design. Fine hand stitching replaces the cantle. This sporran comes complete with an adult sized (48.5) smooth black leather/chain sporran strap as well as a storage box. Handcrafted by skilled artisans in Nova Scotia Canada.